A remake of the famous Stephen King novel, we follow a family who relocate from Boston to rural Maine. 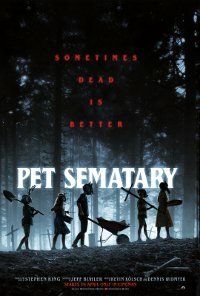 The parents soon discover a mysterious burial ground in the woods, which, after tragedy strikes, sets off a perilous chain reaction that unleashes an unspeakable evil with horrific consequences. This film is releasing in 2D and 4DX. This is the 2D version. Language Infrequent strong impact crude language. Violence Frequent, strong-impact violence with blood-letting.